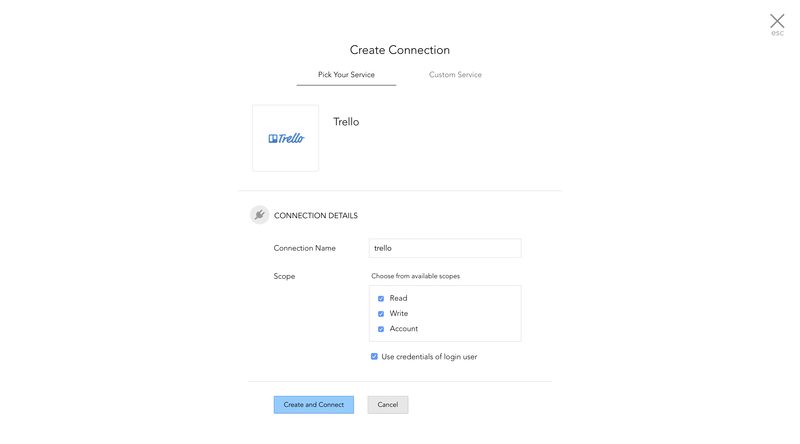 Connections is an interface to integrate third party services with your Zoho Service, in this case, Cliq. These connections are used in an URL invocation task to access authenticated data. To establish a connection, it is necessary to provide a Connection Name, Authentication Type amongst other details. Click Integrations icon in your Cliq dashboard. 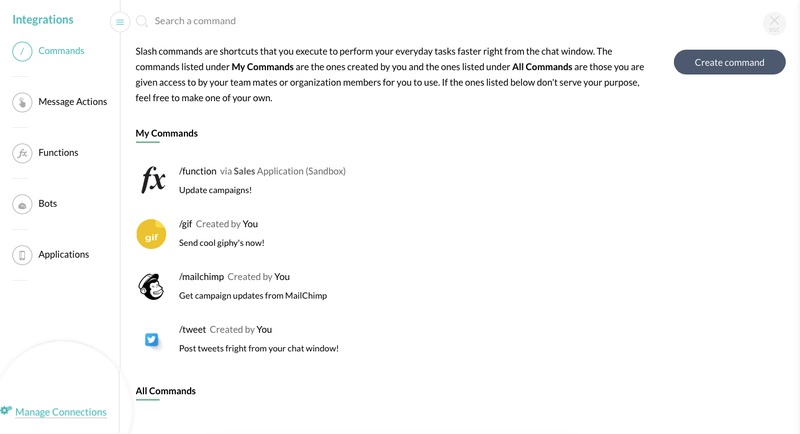 Click the Manage Connections option at the bottom left of the page to land on the All Connections page. Connections created by you will be listed under the own connection section. Connections created by others and authenticated by you will be listed under shared connection. Default - Services listed under the Pick Your Service Category are considered as Default Connections. 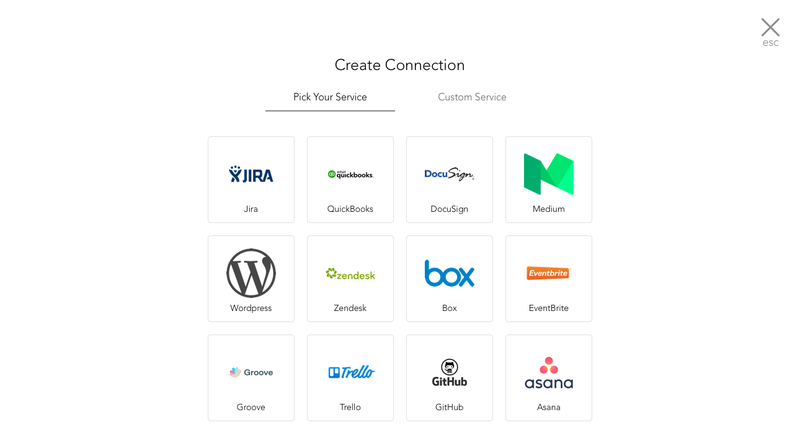 Custom - If you would like to create a connection with a service that is not listed under the Pick Your Service Category, then you can create a custom connection. How to add a new connection? Click the Add Connection option in the top right corner of the All Connections page. The Pick your Service option contains the list of third party services pre-registered with Cliq. These connections when used will have the name of Zoho DRE in the third party services. You can also select the Custom Service option to create a connection in case the service you are looking for is not available in the pre-registered services list. When the service you want to integrate is available in the Pick your service section, you can make use of it by just choosing the service and giving a proper connection name. You have to enable the Use credentials of login user option (user access value) to make the connection use the user authentication. In case the option is not enabled, the connection will use the admin (connection owner) authentication. Here's how a sample connection with Trello can be created. First, select 'Trello' from the list of services available under the 'Pick Your Service' category. You'll land on the 'Create Connection' page. Create your connection by giving a name, selecting the scopes. Select 'Create and Connect' to create the connection. The connection link name will be used in the invoke URL task. Note: The Use credentials of login user option (user access option) defines if the user can provide access to perform integration using their own credentials. When this option is enabled, all the users will see a pop-up dialog box asking them for permission to access the third party service account. When the Use credentials of login user option is not enabled, the owner of the connection usually the one who installs the app will allow other users to perform an action on their behalf. In case the service you are looking for is not available in the pre-registered services list, you will have to create a custom connection. This would require you to create and configure settings in Cliq as well as the third party service. 1. To create a custom connection, click the Custom Service option and provide the following. In case of extensions containing connections that work with the owner credentails (disabling the use credentials of login user option), user who installs the extension will be considered as the connection owner. That is, the connection will be authenticated with the credentials of the user who installs the extension. 3. Upon successful authorization, your connection is created and listed on the connections page. Configure the below given call back URL in the third party service, to connect with Cliq. The invoke URL task is used to access the third party services from Cliq via Connections. To implement a connection that is created, you can use the Invoke URL deluge code displayed on creating the connection. The task and its parameters are explained in the Invoke URL page.